Britain’s messy divorce from the European Union is once again stuck between the demands of Theresa May’s divided government and the reality of what the bloc is willing to offer her -- this time over how long the delay to Brexit should be. With just 10 days left until the U.K. is due to exit the EU, the prime minister is drafting a request for more time to reach a deal that will win the endorsement of Britain’s skeptical Parliament. But she’s facing a battle with Brussels and her own Cabinet ministers over how much time she needs. The issue is now of critical importance as Britain is on course to exit the bloc on March 29 if no deal -- or delay -- is agreed before then. The divorce agreement May spent two years negotiating was rejected twice in Britain’s Parliament. Now she says a delay is required so U.K. politicians can regroup and decide how to proceed. May is drafting a letter to the EU to set out her request for extending the Article 50 deadline beyond March 29. 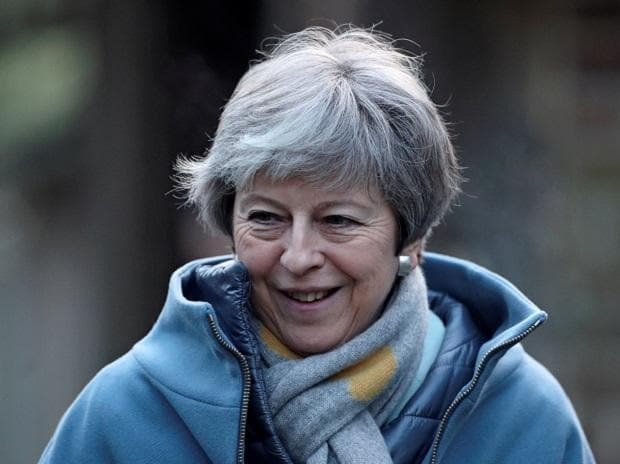 She wants a short delay, but sees that the EU is reluctant to agree to this, fearing that Parliament is still too divided and may never vote to approve her deal, people familiar with the matter said. EU officials say a long delay is probably needed to allow for a total rethink of policy. At a Cabinet meeting earlier on Tuesday, Fox suggested going for a short delay and forcing opposition Labour politicians to choose to back May’s deal or watch the UK exit without an agreement in July. Leadsom told the Cabinet gathering that she was dismayed that her colleagues seemed to have given up hope of getting May’s deal through a vote in the House of Commons. She said the Cabinet used to be determined to deliver Brexit but no longer seemed to be. Some ministers are said to be considering whether to quit the Cabinet if May adopts a long delay.